The San Jose Sharks could win it all against the Pittsburgh Penguins, as I’ve outlined in my prediction for the Stanley Cup Final. 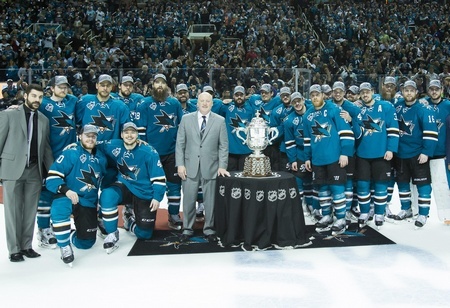 In the interest of digging deeper, it’s time to lay out the case for the Sharks as Stanley Cup champions and to explore some of the storylines to watch when the action gets underway on Monday. The case could be made for the Penguins to hold the advantage in goal, with 22-year-old Matt Murray lighting it up. But ignoring Martin Jones would be a huge mistake. Sure, Jones is just in his first season as a starting netminder. The 26-year-old from North Vancouver started 65 regular season games for the Sharks and posted 37 wins, with a 2.27 goals against average and a .918 save percentage. He had six shutouts. But Jones has more going for him than a statistically notable season. For one thing, he’s a calm presence. Jones doesn’t wander much, especially when the opposition is rushing, and that makes him a sound netminder. He’s a shade better than Murray at covering the angles, too. One could argue that Jones’ positional play makes him less adept at reacting to the puck and that’s true to an extent. But he’s also better at covering his posts, which is critical when play gets messy around the crease. He’s also better at standard coverage, which means the opposition typically won’t shoot through him. San Jose’s power play has become the stuff of legend this post-season and the Penguins will have to avoid the sin bin. The Sharks are 27 percent on the man-advantage, while Pittsburgh is 23.4 percent going into the Final. The Sharks have a lot with the Penguins in terms of how they approach the power play. Both teams roll four forwards, with San Jose sending out Joe Pavelski, Joe Thornton, Logan Couture, and Patrick Marleau on the top unit. It gets deadlier when they throw Brent Burns in the mix. Pavelski, Couture and Burns are all in the top five of power play goals this post-season, while Couture and Pavelski are the top two in power play points. When you consider the second unit includes Joonas Donskoi, Joel Ward and Tomas Hertl, you’re dealing with a lot of balance in the San Jose attack. The Sharks are 8-0 when they enter the third period with the lead. They’ve outscored their opponents 29-14 in the final frame, which gives them a plus-15 differential. The Penguins, meanwhile, are 9-1 when leading going into the third period. But they’ve only outscored their opponents 17-15 with 20 minutes on the clock. Finally, the Sharks are more efficient shooters than the Penguins. While Pittsburgh ranks third in shots per game and the Sharks rank 11th overall with an average of 28, San Jose has made more of their opportunities. They average 3.5 goals a game, tops in the National Hockey League, and hold a 12.5 team shooting percentage. On an individual level, Pavelski has a 21.3 shooting percentage with 13 goals in 61 shots. Thornton, Ward and Couture float around 15 percent efficacy, while Burns shoots the puck so often that his six goals on 60 shots feels earned.